We had an excellent Poetry Reading today, along with our monthly Poetry Workshop and Fiction Writing Workshop. Our Feature Poets were Meg Kearney and Gary Margolis. One of the joys each of them spoke of in various ways is synchronicity or coincidence. Ms. Kearney spoke of places up and down the Hudson River that were once my stomping grounds as well as hers. One of the joys of being Library Director was that during the break between the Open Mic and the Features, I showed some of our art collection to Gary Margolis. 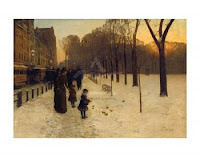 When I told him we have a Childe Hassam he was eager to see it, and told me he planned to read a work based on Hassam's famous Boston Common At Twilight.